With three major decorating holidays just around the corner, we can cheerfully say it’s time to deck the halls! Festive exterior lighting can highlight your home or business for a flawless nighttime showcase. The time-honored tradition of hauling ropes of lights up a precariously placed ladder is inevitable and you’ll want to get the most out of your display. At this point you might ask “Well, how many lights can I put up anyway?” The number of lights you can slather on your rooftop is answered by a simple set of equations. This breaks down to mean the voltage, which is 120 volts for American households, times the amperage of your circuit is equivalent to the total wattage available for use. Since Christmas lights draw a continuous load of power (when they are not twinkling or flashing), you should only use 80% of the power available to you. Therefore, you take the total wattage and multiply that by 0.8 to find the number of usable watts. This equation compensates for any overload you might have, lower the chances of you tripping a breaker or blowing a fuse with your spectacular display. An example would be 120 volts times a 15-amp circuit equals a total of 1800 watts; that 1800 watts multiplied by 0.8 results in 1440 usable watts. So you have a maximum of 1440 watts of power for your lights to run on. Are you wondering how to determine your amperage? Finding the amperage of your circuit for the first equation requires a visit to your circuit breaker box. Most homes run on 15 or 20-amp circuits. Once you figure out which outlet you want to use, check the circuit breaker box to determine which circuit the chosen outlet is on. Systematically turn off and on the switches in your breaker box. As you turn off a switch, check to see which outlets no longer work before turning the switch back and moving to the next switch. Once you find the switch that controls your selected outlet, look at the switch itself. A number should be printed on the switch, indicating the number of amps on that particular circuit. You take the results of the first equation, in our example it’s 1440 watts, and divide that number by the wattage of a single bulb. The answer is tells you the total number of lamps you can run continuously from one outlet. The solution to this equation can vary greatly depending on the type of bulb you intend to hang up. Traditional incandescent bulbs use a lot more power per bulb while LEDs use a smaller amount. You can easily have 3 to 4 times more LED lamps than their incandescent counterparts. The chart below is a comparison of some of the basic LED bulb wattages and their max runs versus standard incandescents on the average 15 or 20-amp circuit. UPDATE: Our LED C9 bulbs now consume only 0.46 Watts per bulb. This raises the total lamps on a 15-Amp circuit to 3,913 and 5,217 lamps on a 20-Amp circuit. 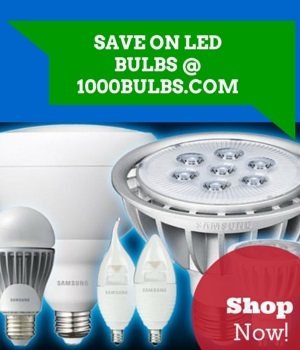 Obviously LED bulbs come out on top because of their generally energy-saving nature. The incandescent max run can only be achieved by using a maximum 250-foot commercial stringer and buying the bulbs separately to fill the sockets, simple 25-lamp box sets cannot carry the power current far enough and stay lit. The next paragraph will explain why this happens. The last thing you need to consider before beginning your illuminated exhibition is the wire gauge of your lights. Wire gauge also decides how much electrical current can be carried and how many strings of lights can be connected end-to-end, in one continuous run. You will want to purchase commercial grade light strings which are made from 18 to 22 gauge wire. The larger the gauge number, like 22 for example, the smaller the wire and smaller wire gauges cannot carry as much electricity. With LED bulbs this is less of a factor since power usage is near non-existent at times, but UL safety recommendations advise that only 216 watts of bulbs be used on one circuit. Meaning you can most likely connect 3 to 5 strings of traditional incandescent bulbs together before you hit that magic number. Also it’s one circuit per 216 watts, not one outlet; if you decide to add more lights, you need to use an outlet on a different circuit. If you are still uncertain about your run after doing the math and find that the last string of lights refuses to light up, you are experiencing a voltage drop and you need to disconnect some lights. As stated earlier, try not to use more than 80% of the possible wattage. The reason for that is when too many lights are on one circuit, initially the lights may work until the circuit heats up and then pops or blows its fuse. It should also be mentioned that this equation only works for copper-wired circuits. If your building was wired before the 1970’s and hasn’t been updated since, you most likely have aluminum wiring and that wire type cannot support the same number of lamps. Do you have ideas on how to add some pomp and splendor to your holiday fanfare, advice on the best ladder placement, or more questions about setting up lights? Please drop us a line below. Check out our Facebook, Twitter, Google Plus, LinkedIn, or Pinterest for a myriad of holiday tips and treats. Contact our spirited staff at 1000Bulbs.com, who await your quests for a more extraordinary sparkle.